Climate change is wreaking havoc on global food and water supply and Singapore, a tiny city state without natural resources, is at risk of bearing the brunt of the damage. Sea levels are rising, and droughts and extreme storms are getting ever more frequent. In turn, farming and fishing communities are disappearing as repeated extreme weather events wipe out entire crops and fishing grounds. The lack of rain has also caused rivers and dams to dry up, even in neighbouring Malaysia in previous years, cutting water supply to communities. Singapore gets the lion's share of its raw water from across the Causeway, largely from Johor's Linggiu Reservoir, which can meet 60 per cent of Singapore's water needs during times of normal rainfall. The country also imports more than 90 per cent of its food. At the same time, global warming is pushing up demand for electricity, where conventional generation of it using fossil fuels is one of the biggest contributors to greenhouse gas emissions - the most significant driver of climate change. How then can Singapore ensure a reliable supply of water, food and energy that can be sustained for generations to come? The answer is astute planning, learning and innovation. If you go by numbers, it would appear Singapore does not stand a chance at water independence. It is 460 times smaller than Malaysia by land area. Its 17 freshwater reservoirs combined are but a fifth the size of Linggiu Reservoir. But when a dry spell in 2014 led the reservoir's water levels to drop to new lows, which at its worst was just 20 per cent in October 2016, it was Singapore that supplied Malaysia with additional potable water to help tide it over. The Republic has defied the odds out of sheer necessity, bolstered by a strong political will, effective water management laws and an experienced and motivated people, said water experts. Singapore can draw up to 250 million gallons of water a day from the Johor River under the 1962 Water Agreement. The treaty, however, expires in 2061. This, along with the expectation that water demand will rise as the country's population grew, pushed its leaders to plan ahead. 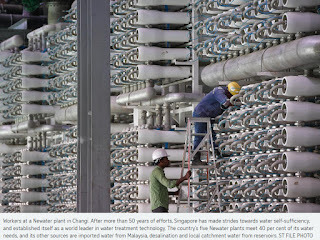 After more than 50 years of unceasing efforts, Singapore has made strides towards self-sufficiency in water supply, and established itself as a world leader in water treatment technology. Today, Singapore has not one but four sources of water, or what are known as the country's four national taps. They are imported water from Malaysia; Newater or treated used water; desalination or treated sea water; and local catchment water from the reservoirs. At present, two-thirds of Singapore's land area is water catchment, which PUB, the national water agency, plans to increase to 90 per cent of the island by 2060. Given Singapore's small size, it has looked to the sea and to water reclamation as well. Using advanced membrane technologies and ultra-violet disinfection, PUB purifies treated used water that has been rid of solid particles as well as bacteria and viruses. The end product: Newater. 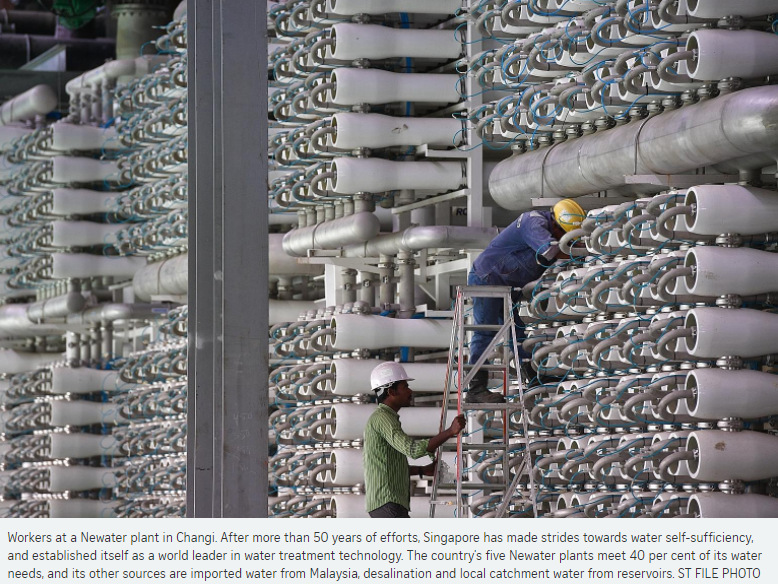 There are five Newater plants that meet 40 per cent of Singapore's water needs. PUB has started phase two of its construction of the Deep Tunnel Sewerage System, an underground sewage superhighway that will be the conduit for all used water islandwide and help give water recycling a boost. Sea water surrounding the island is also treated at two plants through desalination, where salt and minerals are removed through reverse osmosis, producing enough water to meet 25 per cent of Singapore's current water demand. Two more desalination plants are being built. By 2060, Newater and desalination could together meet up to 85 per cent of Singapore's water needs, when water demand is expected to double from the 430 million gallons used daily currently. These days, water purification membranes developed by local researchers are even used outside of Singapore, including China and the International Space Station. Still, research and development of water treatment technologies are still ongoing. In January, PUB invited industry technology providers and researchers to develop solutions that will improve the effectiveness of Singapore's water treatment processes and operations, including lowering the energy use. It is setting aside up to $30 million for the researchers selected. Singapore imports 90 per cent of its food supply, but from more than 160 countries. This diversification strategy is employed by the Agri-Food and Veterinary Authority of Singapore (AVA) to ensure that shortages and price volatility, due to, for instance, extreme water events or restrictions or bans imposed on exports, do not endanger the nation's food supply. But to ensure that it is also partly self-sufficient, local food production targets have been set for three types of food produce: 10 per cent for vegetables, 30 per cent for hen eggs and 15 per cent for food fish. This provides a "critical buffer against global supply shocks for especially key food items", said Senior Minister of State for Trade and Industry and National Development Koh Poh Koon last year. At present, local farms produce 13 per cent of vegetables, 27 per cent of eggs and 10 per cent of fish consumed here, production levels that the AVA hopes can be boosted through the use of technology. Some, such as vegetable farm Kok Fah, have embraced technology, using advanced greenhouses and irrigation systems to mitigate the effects of extreme weather changes on their crop growth. Meanwhile, local fish farm Barramundi Asia has automated many parts of its operations, from feeding to net cleaning. The other approaches the Republic is using to achieve food security are to help local farms and food companies venture abroad to seek opportunities, increasing demand for local produce and help local farms to seek financing. Last year, Singapore was ranked the fourth-most food secure country, in terms of food availability, affordability and quality and safety, behind Ireland, the United States and Britain, in the Economist Intelligence Unit's Global Food Security Index. There has been a global shift towards renewable energy as countries try to curb emissions of carbon dioxide and other greenhouse gases, and Singapore is no exception. According to the UN Environment Programme and Bloomberg New Energy Finance, global solar capacity grew faster last year than the combined total for all fossil fuels - coal, oil and gas. A White Paper last year by the Sustainable Energy Association of Singapore, a non-profit business association, said solar energy could meet up to a quarter of Singapore's energy demands by 2025. About 95 per cent of Singapore's electricity still comes from natural gas, with solar energy accounting for about 2 per cent. But the plan is to ramp up solar energy to 5 per cent by 2020. Just this month, the Solar Energy Research Institute of Singapore at the National University of Singapore launched three projects to improve the production of solar electricity. They include "islands" made up of solar panels floating in its coastal waters, which will supply electricity to nearby industrial zones or living areas. Constraints in land, water and energy have led Singapore to plan, learn and innovate, to achieve security in all three aspects, which has become ever more important in the face of climate change. To enhance Singapore's food security, the Government is encouraging farms here to do more with less, by using technology and new-age farming techniques. The vegetable farming land parcels are among 36 new plots in Lim Chu Kang and Sungei Tengah spanning 60ha, which the Agri-Food and Veterinary Authority of Singapore (AVA) will be tendering out in tranches. The process started last August and will last beyond the start of next year. AVA said experienced farmers who have good track records and are willing to adopt high-tech farming methods will stand a good chance of winning the bids. Singapore has more than 200 food farms, which produce less than 10 per cent of the nation's total food demand. To give these numbers a boost, several high-tech farming methods are being researched and developed here. For instance, Singapore is looking into how more coastal farms can use closed containment aquaculture systems which separate the water where the fish are kept from the water in the natural environment. These tanks, which can be placed in barges or on land, will protect the fish from oil spills and harmful algae blooms. At Nanyang Polytechnic, researchers have found a way to package a vaccine for a common bacterium in tropical waters, Tenacibaculum maritimum, using a tiny nano material. This will allow fish farmers to vaccinate their fish stocks by immersing them in a container of water containing the "nanovaccine", instead of having to inject them individually, which is labour intensive and time-consuming. Temasek Polytechnic researchers have developed an oral vaccine against fish iridovirus - a common disease in farmed fish that can kill them - by inserting parts of the iridovirus into a special type of microalgae, which is then mixed with feed and fed to the fish. This also removes the needs for vaccine injections. While the use of technology by farms here is in its infancy, it is the way to strengthen Singapore's food safety net, so that extreme weather conditions caused by climate change, or restrictions or bans imposed on exports, do not dampen food supply here. This is the fourth of 12 primers on current affairs issues that are part of the outreach programme for The Straits Times-Ministry of Education National Current Affairs Quiz.